Investigate the Royal Guards to search for evidence related to a possible plot against the King. Speak with Tienius Delitian in the Royal Palace Throne Room and agree to help him find any disloyal Royal guards. Speak with Ivulen Irano about the two kings. Speak with Tienius about Irano. Speak with Irano again, this time mentioning your connection with House Hlaalu. Speak with Aleri Aren in the Guard's Quarters about what Irano said. Search Irano's belongings in the top of the Guard's Quarters. Get the handwritten note. Return the note to Tienius. 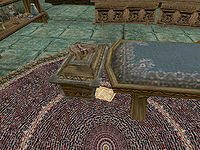 Speak with Tienius Delitian in the Royal Palace Throne Room again and agree to help him further. He wants you to check out the loyalties of the Royal Guards currently in service. You are to pretend to be a new recruit wishing to join the Royal Guardsman. You are not to take any actions but merely return any information you find to Tienius. He also mentions not to speak of your connections to House Hlaalu, even if you have no connections to House Hlaalu at all. Speak to the Royal Guards in the same room as Tienius. You will want to boost their disposition before you ask about joining the Royal Guards. Again, don't mention any House Hlaalu connections, but keep the discussion on the topic of the two Kings. Most will give pretty good answers without any suspicions, but Ivulen Irano will give a particularly weak response and you'll get a matching journal entry. If you return to Tienius now, he'll suggest that you keep looking for more information on Irano's loyalties. Return to Irano and tell him of your Hlaalu connections. Do this and he'll tell you to speak with Aleri Aren, and not to speak with Tienius Delitian. It seems like something a little suspicious is going on here. 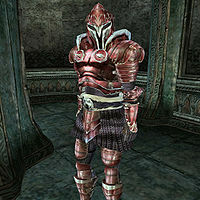 Aleri is a Royal Guard who can be found on the second floor of the Guard's Quarters. Talk to her about joining the Royal Guards again and mention your Hlaalu connections. She is surprised that Irano directed you to her and told you not to speak with Tienius, and says she will speak with Irano further on the matter. Apparently he is not too bright and gets confused at times. At least that's what she says... as your journal entry for the matter says, Aleri may be covering up something that Irano shouldn't have said. Return to Tienius with this information, and he'll suggest that you look through Irano's possessions in the Guard's Quarters for any further evidence in the matter. He warns you not to be noticed or you will be charged with theft like a common criminal. You'll find a chest belonging to Irano at the top area of the Guard's Quarters (it is plainly labeled with a 50 level lock). There's nothing in the chest that seems suspicious, but a careful search of the floor around Irano's chest will reveal a small handwritten note containing the Roster of Guards for the past few weeks. Be sure to watch out for the patrolling Guard so that he doesn't see you when you take the note. It suggests that Irano is planning something when only certain guards are in the throne room. Take this note back to Tienius. Return to Tienius with the note and he will gladly accept it, saying he'll change the watch schedules to prevent anything bad from happening. Make sure you do not have a bounty on your head or else Tienius will fine you like any other guard. Underneath Irano's pillow is another note, a copy of The Common Tongue. Bringing this note to Tienius will not complete the quest. 1 Tienius Delitian has questions about the loyalties of some of the Royal Guards. I'm to pose as a candidate wanting to join the Guards as an excuse for talking to the guards, sounding them out, and looking for evidence of disloyalty. If I find any hint of treason or find evidence of disloyalty, I should bring it to Tienius Delitian. I should take no action against any guard, but should let Tienius Delitian decide what to do. 5 When I asked Ivulen Irano about King Helseth, he delivered what sounded like a memorized and not-very-sincere sounding speech. Maybe he's just not very bright. But maybe he's just not a very good liar. 10 Ivulen Irano made a special point of telling me to tell Aleri Aren about my Hlaalu connections. He also made a special point of my NOT telling Tienius Delitian. 15 I spoke to Aleri Aren about my Hlaalu connections, like Ivulen Irano suggested. Aleri Aren acted like she didn't know what he was talking about. I suspect Ivulen Irano said something to me that he shouldn't have, and Aleri Aren was covering up for him. 50 Near a chest owned by Ivulen Irano I found a handwritten copy of guard duty rosters for the past several weeks. The handwriting is tiny and almost illegible, with frequent misspellings. But three names are always correctly spelled -- Milvela Dralen, Ivulen Irano, and Aleri Aren -- and those watches when all three are the only guards in the Throne Room have been underlined twice. This is quite peculiar. I think it is what Tienius Delitian has been looking for. 100 Finishes quest After reading Ivulen Irano's handwritten notes on the watch schedules, Tienius Delitian agreed that I'd found clear evidence of disloyalty among the guards. He praised my work, and asked me for help with another official matter. This page was last modified on 13 April 2013, at 03:34.